Our very own Caron Brick is a nominee once again for the Camp Administrator Hall of Fame. Caron, of course, is the long-time Director of Administration at Camp. If you have phoned our Burlington Office, you’ve likely spoken to Caron. She has overall responsibility for the administration of our Summer Camp, Outdoor Education Centre, and Women’s Weekend programs. In many ways, Caron is the public face (and voice!) of Camp. She responds to countless phone calls and emails each year. For all those parents anxious about sending their child to Camp for the first time, she offers calm reassurance. She has answered thousands of parent questions, and given families the confidence that a Camp experience is right for their child. She is a dear friend to many of us, a valued colleague, and a tremendous ambassador for Wenonah. The Camp Administrator Hall of Fame was launched by CampBrain to acknowledge the fabulous work done by camp administrators across North America. This year, three nominees will be inducted into the Hall. 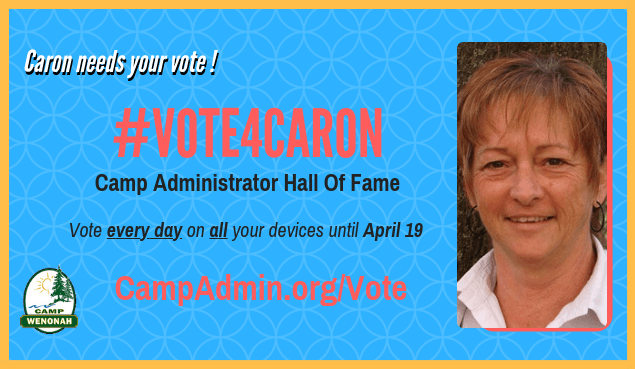 Vote for Caron every day between now and April 18. On behalf of all of us, thanks for your support of Caron!